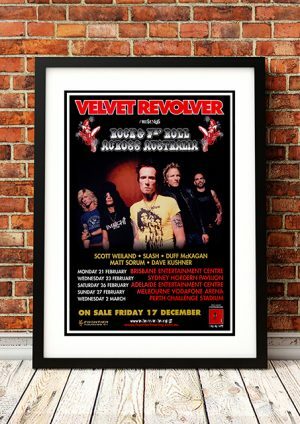 Classic Velvet Revolver Band Concert Posters and Memorabilia! Buy Online Now! Velvet Revolver began with a spring 2002 jam session that reunited ex-Guns N’ Roses bandmates Slash (guitar), Duff McKagan (bass), and Matt Sorum (drums) on-stage. With the discovery that their chemistry was still going strong, the trio began pushing around some new music and auditioning singers for what became known as “the Project.” Early entries included ex-Buckcherry shouter Josh Todd and Neurotica‘s Kelly Shaefer; both became acquainted with the cutting room floor. By early 2003, the existence of “the Project” — and its quest for a singer — was common knowledge, so much so that VH1 sent cameras to document the search. Dave Kushner(Wasted Youth, Dave Navarro) also joined up as second guitarist. By June, “the Project” had been renamed Velvet Revolver, and Weiland was officially made its lead singer, though possession charges stemming from a May bust were still outstanding. The band signed a deal with RCA and spent the rest of 2003 fitting in gigs and recording sessions around Weiland‘s court-ordered rehab. RCA next announced an April 2004 release for Contraband, Velvet Revolver‘s full-length debut; the date was then pushed to May, and finally to June. That spring, Weiland labored through court dates and recovery as Slash and Duff did advance press for Contraband, and fan anticipation for the album grew. VR also released the single “Slither,” a rabid, ambitious rocker guided by Slash‘s signature guitar sound. The single sidled steadily up the active rock charts, and when Contraband finally dropped, it was to general appreciation for its mix of STP and GNR signatures and its surprising turn toward hedonistic maturity. Velvet Revolver‘s sophomore effort, Libertad, followed in 2007. In December 2015, Weiland was found dead in Bloomington, Minnesota, while on tour with his then-band, the Wildabouts. 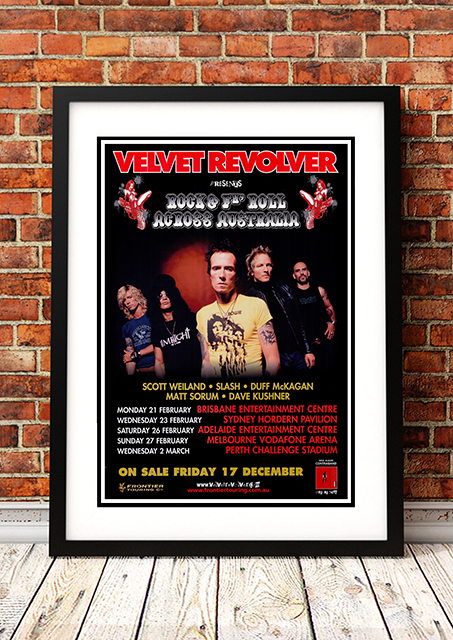 We stock some awesome Velvet Revolver Band Concert Posters.